Have you ever made a peanut butter and chicken sandwich? Have you had “spaghetti tacos” for dinner? Do you use sprinkles as a condiment? Do you think chocolate milk should basically be a food group? If you answered yes to any of these questions, then you are probably the parent of young children. Kids can be messy eaters, picky eaters, slow eaters, or stick to a personal code that only allows eating foods that are covered in cheese or ketchup. Some children—legend has it—are even said to be “good eaters,” but we were not able to independently confirm this in our research. Regardless of your family’s dinner routine, with a meal kit delivery service—help is on the way. 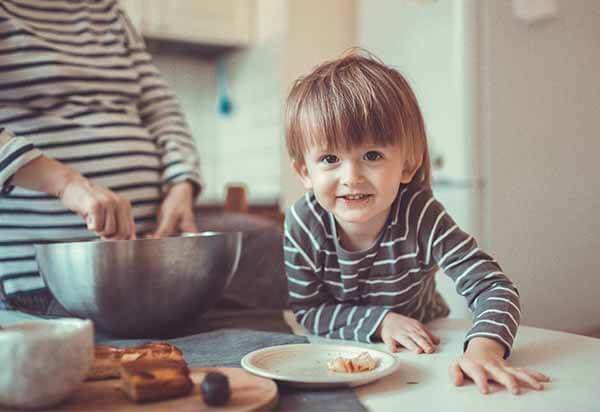 For busy parents of young children, meal kits help you craft healthy, delicious meals for you and your kids, without having to run out to the grocery store or find the headspace to come up with new and creative recipe ideas. These meal kit recipes are designed to be easy—typically there are only a handful of steps—meaning the family should be sitting down to eat within about a half hour or so. Why Are Meal Kits Good for Kids? 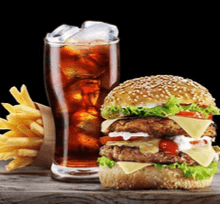 When picking out food for your kids, sometimes it can seem like everything is loaded down with sugar and salt, and way too many “kid-friendly” options are deep-fried or heavy on the processed meats. One of the top draws of meal kit services is the focus on top-quality ingredients. 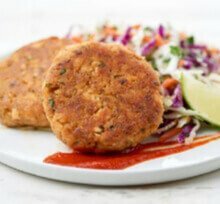 These can include FDA-certified organic produce, premium proteins, and sustainably-sourced fish and seafood. Now, this can be good for the environment, but more importantly, it means that your kids will be eating high-quality ingredients that have been selected with care. In addition, most meal kit companies employ dieticians, nutritionists, and chefs to design meals for their portfolios. This ensures that not only do you have healthy ingredients, but you can also count on interesting flavor combinations that both kids and adults can enjoy. Keeping things stress-free in the kitchen is one of the biggest draws of meal kits. Most companies design their meals to take no longer than about 30 minutes to make. The meals tend to involve about a half-dozen ingredients—all of them pre-portioned—and about 5 or 6 steps to whip up. You don’t need any specialized cooking skills or really much experience in the kitchen at all. Also, most of the recipes come printed out on colorful recipe cards that you can easily follow step-by-step. What’s this mean for dinnertime? It means that the recipes are easy enough for your kids to help out and the whole family can have a fun and engaging time cooking together in the kitchen. That’s Great, but What Type of Food Do They Have for Kids? With most meal kit companies, you will have a set number of recipes per week on the regular plan, and fewer options for the family plan each week. For instance, with Blue Apron, each week you can choose from 8 2-person recipes or 5 4-person (family) recipes, and on HelloFresh, there are 15 meals on the classic plan each week, and 6 on the family plan. The family recipes are typically recipes that include 4 servings, 2, 3, or 4 times per week. This is designed for the nuclear family, but for single parents with one child, ordering a 2 person meal can get the job done too. Meal kit companies tend to compromise a little bit when it comes to their family recipes, but that doesn’t mean it’s just Mac n’ Cheese and peanut butter and jelly sandwiches with the crust cut off. This is no set-in-stone rule, but typically these meals are less likely to be spicy or elaborate and are often single pot dishes, like stir-fry or pasta. Picture dishes like sesame chicken and rice, orzo with broccoli, or the type of fun stuff that a kid would come up with, like the beef taco pizza offered by HelloFresh. You also have somewhat more adventurous stuff like guajillo pepper chicken and cheesy rice (the cheesy rice should help), or the chicken tagine with preserved lemon and artichokes from Sun Basket. These recipes lend themselves well to leftovers too, proving that sometimes the sequel can be just as good as the original. In our hearts, many of us dream of hearing those 3 little words: “No cooking required.” This Home Chef meal can be whipped up in about 5-10 minutes. 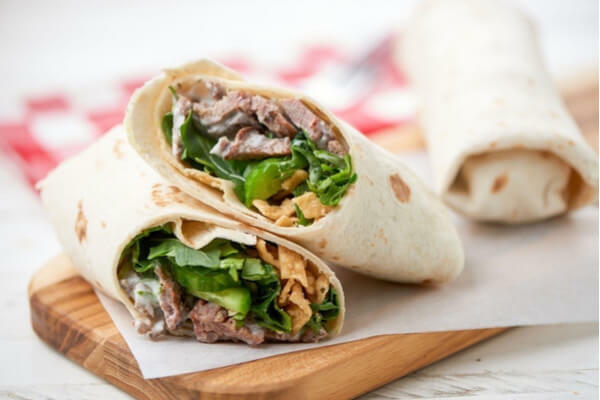 Just heat up the steak, chop the vegetables, and then you and your kids can take turns dressing and rolling up these wraps. It’s never too early to teach your kids about tortillas—the incredible, edible utensil. Now this is one of the “five minute lunches” offered by Home Chef, so it’s best for the weekend, or when the kids are out of school for the holidays. Every week with Home Chef you can choose from 16 different recipes, as well as 2 add-ons. These are typically either a fresh fruit smoothie or a seasonal fruit basket. Both can be delicious, and a great way to polish off your meal, while also helping your kids develop a taste for great, healthy desserts that aren’t just popsicles or ice cream. Home Chef is committed to “provide you with fresh ingredients from our community of trusted suppliers, source locally when possible, and choose partners with sustainability practices we believe in.” For people with specific meal preferences or dietary needs, the offerings are separated into a wide variety of categories, including vegetarian, without nuts, poultry, without soy, customer favorites, without milk, staff picks, and much more. Back in the far off days of yore—when we were kids—if you had soup for dinner, chances are it came in a can that your parents opened and plopped into a pan to heat up. You crumbled some crackers into it and waited for it to cool off while you watched cartoons. It was one of your favorites, but the thing is, there’s a better way. 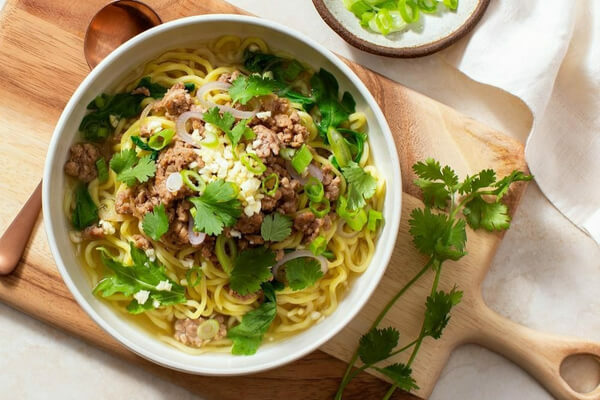 This homemade Taiwanese-inspired soup brings together fresh ramen noodles and ground pork swimming in a piping hot broth that’s topped with a garlic-scallion garnish. Did we mention it only takes 20 minutes to make? It’s also low on calories and fat, and high in protein, and a fun way for your kids to get a taste for delicious noodle soup. Warning: There will be slurping. More than almost any other food kit company, Sun Basket has built its brand around 100% USDA-certified organic ingredients, so you know your feeding your kids the best. You also get more variety than with almost any other company, with 18 recipes per week on the classic menu and 6 on the family plan. Sun Basket’s recipes feature a “Kids Can!” section, highlighting simple ways your kids can help prepare the meal. For example, with the Taiwanese Noodle Soup, your kids can help measure the water, divide the tamari in half, strip the cilantro leaves, and garnish the dish. You didn’t think we’d finish this article without mac n’ cheese did you? And paired with fried chicken? If that’s not a power couple, we don’t know what is. This recipe is a twist on fried chicken that cooks in the oven, saving you the hot oil mess and a lot of the fat and calories that come with frying up chicken. 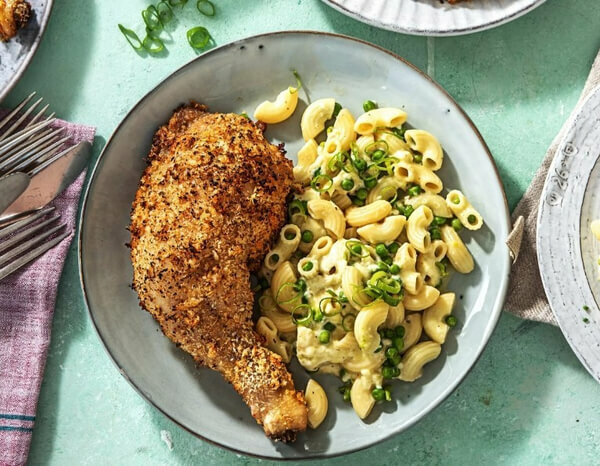 Instead of the typical batter, the chicken is coated with a panko crust that you pop in the oven, giving you a crispy chicken dinner that might have you forgetting about the Colonel for the time being. And paired with creamy macaroni and cheese? That’s hard to beat. 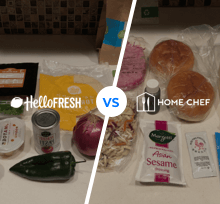 No matter what you make with HelloFresh, you should be in and out of the kitchen in about 30 minutes. All of the recipes are only 6 steps and are designed to be easy to follow. There are 15 meals offered each week on the classic plan, and 6 on the family plan. There are also 3 veggie meals offered per week. The company offers breakfasts and “hall of fame meals” that are destined to please even the pickiest eaters. Rare is the parent who has not perfected their weekly spaghetti with meat sauce recipe. It’s a go-to recipe, one you always keep in the wheelhouse when you’re short on inspiration and looking for a surefire winner. This recipe from Plated takes your meat sauce from practical to prestige, combining penne pasta cooked al dente with turkey bolognese, big chunks of fresh butternut squash, and a healthy dollop of mascarpone cheese. Easy to prepare, and ready in 20-30 minutes, this dinner may have you putting another pasta favorite on your go-to list. With Plated you get to choose from some of the most creatively-crafted, high-quality recipes anywhere in the industry. We’re talking about ingredients like merguez, burrata, and gochujang that are easy to love (and hard to pronounce) and may be just as new to you as they are to your kids. And if you’re worried about where your food comes from, Plated uses fresh organic produce, sustainably caught fish and seafood and meat that is hormone and antibiotic free. Plated also knows a thing or 2 about variety, and offers 20 recipes and 2 desserts every week. 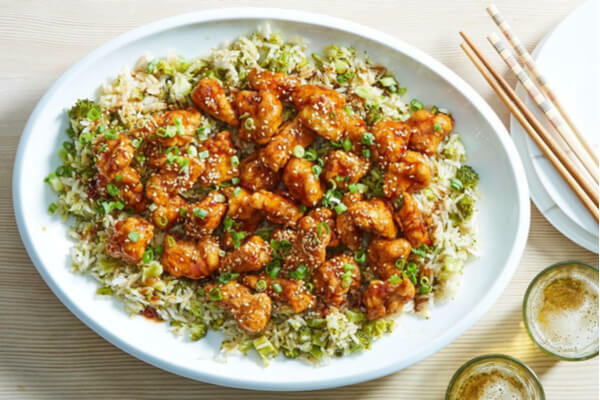 Sesame chicken is a feature of just about any Chinese restaurant in the US, a fan favorite that’s especially popular with kids. And really, what’s not to love? Juicy, perfectly pan-fried chicken coated in a tangy delicious sauce on a bed of broccoli and jasmine rice. American-Chinese food is a world of cuisine that many people are too intimidated to try to make at home. This recipe though, is only 6 steps and should take only about 30 minutes or so to prepare. *Chopsticks and fortune cookies not included. We’d wager there’s no shortage of stressed, overworked parents who wish they had someone like Martha Stewart backing them up around the house. With Martha and Marley Spoon you get access to the know-how and fine living aesthetic of Stewart, with recipes that should take your family cooking to the next level. Each week you get 10 recipes to choose from, carefully-selected from over 18,000 recipes from Martha Stewart’s publications. They’re organized into helpful categories like “kid-friendly” and “under 30 minutes” that should help steer you in the right direction. Ok, so What’s for Dinner? Cooking at home with your kids is a bonding experience that can be fun, messy, and memorable. Most days though, it can seem like a race-against-time, trying to whip together dinner for hungry kids after a long day at work, when you’re short on ideas, patience, or time. Meal kit companies understand this and have created meal plans that can help you cook better food at home for your kids and you. The meals will be delicious, easy to make, and who knows, the kids might even help with the dishes. So take a minute to see which plan is best for your family, and get cooking!